In May 2018, four AmeriCorps VISTAs joined the Sunset Area Transformation Project to provide additional capacity and support for the project. 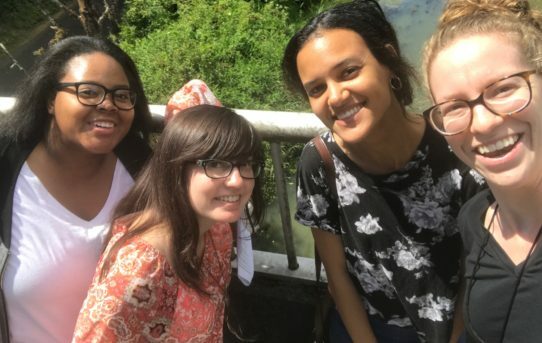 MyKa’La Alexander, Hannah Bahnmiller, Rachel Butler, and Stephanie Snyder are the volunteers for the first year of this three year project. The Renton Sunset Area Transformation Plan and Renton Innovation Zone VISTA project will: (i) seek to engage residents and businesses to collectively address problems and create opportunities for personal and community enhancements, (ii) help create a multi-service and career development center to provide place-based services for economically disadvantaged adults and children to combat poverty, (iii) provide support and access to job training and other skills development services for economically disadvantaged individuals to create pathways out of poverty; and (iv) help build the system-wide capacity of providers to meet the educational and developmental needs of children and youth with an emphasis on early childhood learning and out of school time activities. The VISTA project expects to benefit 440 residents (including both adults and children), 15 businesses, 40 staff or volunteers, and 16 organizations (potential duplicated figures) during the first year of the three-year project. Four VISTA members will contribute to the goals of the project by performing activities such as working with residents and businesses to address community needs, writing grant applications to leverage funds to renovate and operate a multi-service center and address other community needs, expanding and strengthening partnerships with healthcare, employment, and job training organizations to increase services for disadvantaged individuals, and expanding partnerships with community-based organizations to increase early learning and out of school time services for children. The Renton Sunset Area Transformation Plan and Renton Innovation Zone project will target and serve two very diverse, high-poverty, high-need suburban communities in the greater Seattle area in King County in Washington State: the Sunset Area and surrounding neighborhood in the City of Renton and the West Hill/Skyway community in unincorporated King County, adjacent to the City of Renton.